Our new produce delivery app is now available in the App Store and Google Play. After over a year of development and input from members along the way, we are extremely excited to announce the launch of our new mobile app. It will allow users to easily navigate our delivery software using just their smart phone. A first in Ontario, and possibly Canada, our mobile app connects users to not only our farm, but the bounty of farmers and local producers across Windsor-Essex and Chatham-Kent. Here’s a few ways our new app will help make your life a little bit easier. Once downloaded, the app opens with a login screen for returning members to log into their account. However, for new customers, it’s very simple to click on the “New Customer” link and begin signing up for a new scheduled delivery. Customers can choose from one-time, weekly or bi-weekly. As always, there is no commitment and we never charge a delivery fee. 2. Customize Your Delivery To Exactly What You Want. Each week we release the menu for the following weeks delivery. Through the app, members will receive a notification on their phone alerting them that the menu has been released. When the app is opened, all of the items for the following week will be presented. Just like on our website, any substitutions can then be made for items that you may not want, ensuring you receive exactly what you and your family enjoys. As our members know, we’re not just a local produce delivery service. We also offers dozens of products made both locally and nationally recognized organic brands. Our new app makes it easy to tap and choose items to be added on to the next delivery. Whether it’s a bag of homemade pirogies or a famous Windsor made pizza, we’ve got you covered. One of the worries people often have is what happens if we have to head out of town. Users can now completely control their own schedule through the app. 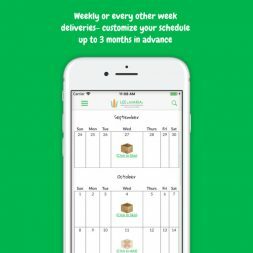 Worried you’re leaving for the cottage or taking a quick trip out of town, just click on your schedule to skip the delivery. As always, there are no commitments. One of the major advancements of our app is delivery notification. Our drivers will now scan your receipt as soon as their deliver your bin at your door step. This will trigger a notification to your phone, letting you know your bin of fresh local produce is at your door step. No more checking the porch every few minutes to see when the delicious box of goodies has arrived. Getting a local produce delivery will improve your health. One of the main benefits we hear from long-time members is the convenience of having local vegetables and fruit in their fridge all the time. Instead of grabbing that bag of chips, grab an apple. Instead of running to the store for some pop, enjoy a kombucha you just had delivered. Our app makes it easy to keep your family healthy. When you order a delivery from Lee & Maria’s, it isn’t just our farm you are getting produce from. Unlike a traditional CSA, we work with a team of over a dozen farmers from across Windsor-Essex and Chatham-Kent to provide a wide range of fruit and vegetable options. As well, our app makes it simple to add on items from small businesses across the region. We work with producers of all sizes to help them build their clientele and reach a wider range of customers. You’ve come a long way kids .Proud of you! Keep up the modern stuff, and your good old natural stuff. You’ve got the best of both!! A good idea would be a “School Lunch” bin. I would love to have snack friendly veggies and fruit delivered for school. I know this can be done with the other bins, but maybe more targeted for items that are perfect for packing a lunch.